I finally finished a mix media project that I created for Michaels' Springtime in Paris contest. I am uploading the entry later today but thought that I'd share my project here first. My heart skipped a beat when I read the Michaels' email newsletter announcing the contest last month. 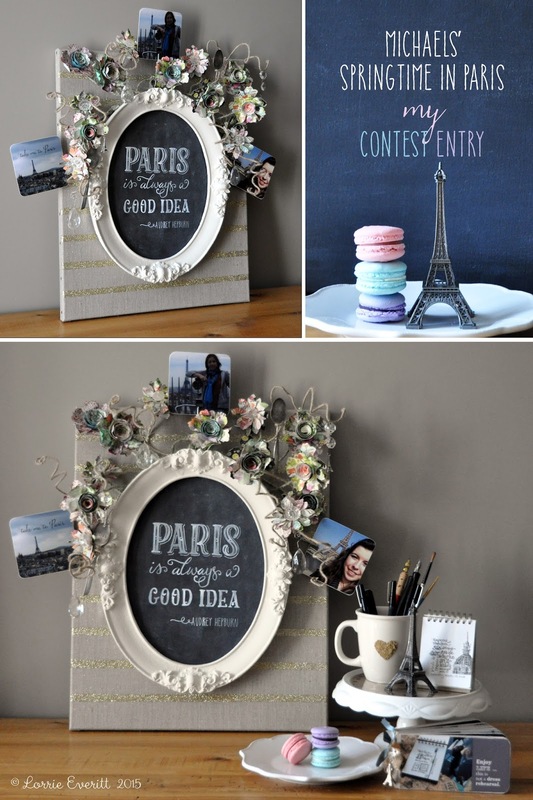 The grand prize for the contest is a trip for two to Paris! It was hard to pick just one category for the contest ... art, floral, baking, papercrafting or jewelry ... I love doing ALL of those things. 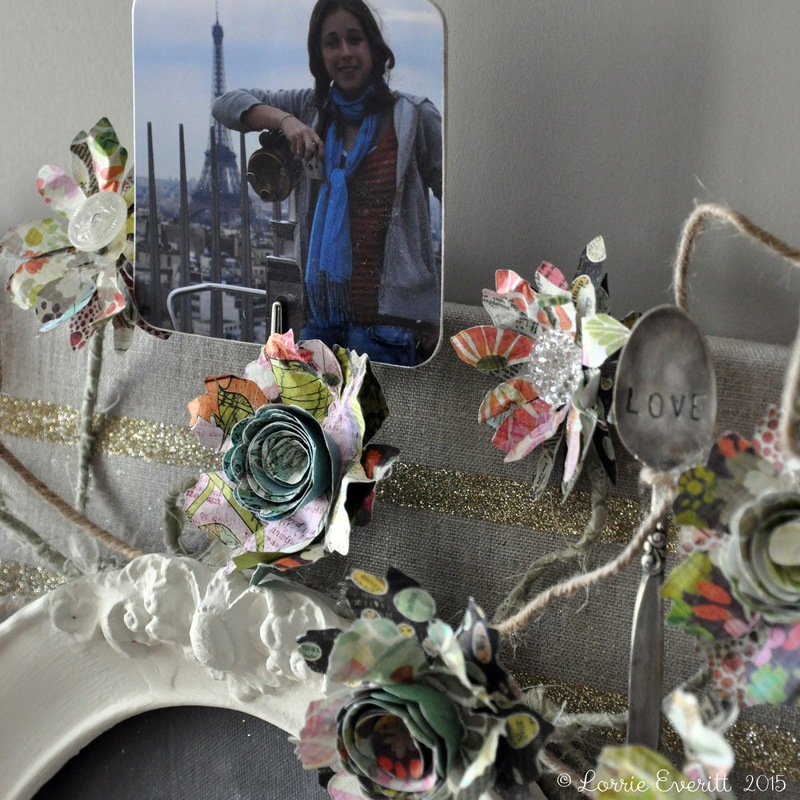 My entry is a mixed media piece that is a combination of so many different things that remind me of the time I spent in Paris with my oldest daughter, Haley, as a parent chaperone for a March Break school trip in 2008. One of the first places that we toured in Paris was the Palace of Versailles and it was the main inspiration for my project. I started with a stretched linen canvas that has lovely nail head details on the sides. I added gold stripes to the canvas using Martha Stewart’s decoupage, gold glitter and masking tape. 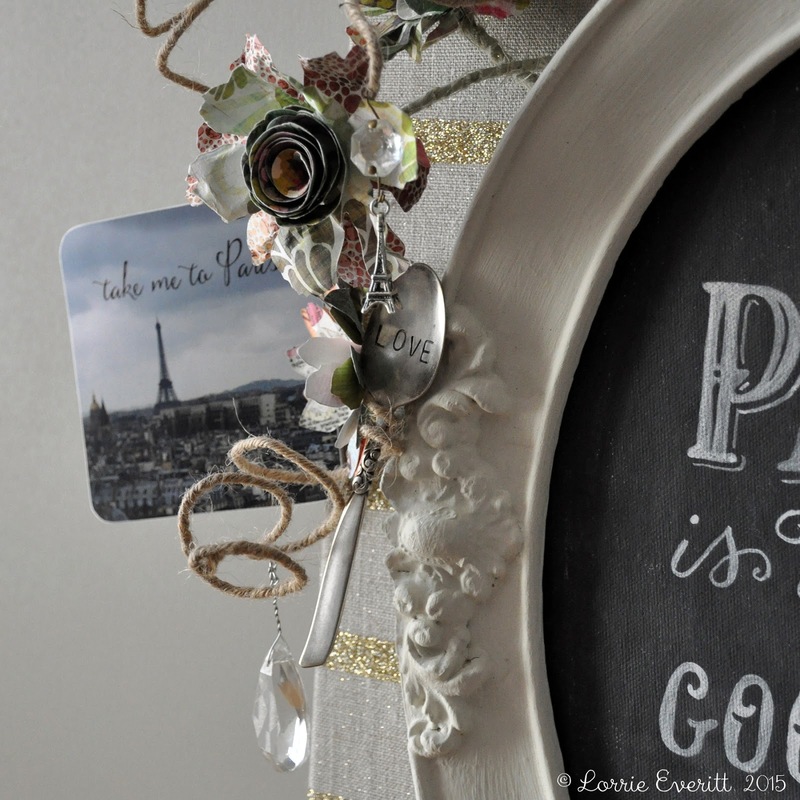 Audrey Hepburn’s quote “Paris is always a good idea” seemed like the perfect saying to add to the framed chalkboard element I wanted to use as my focal point. I painted a piece of canvas with Martha Stewart’s black chalkboard paint and added the lettering using a chalk marker and a fine paint brush. 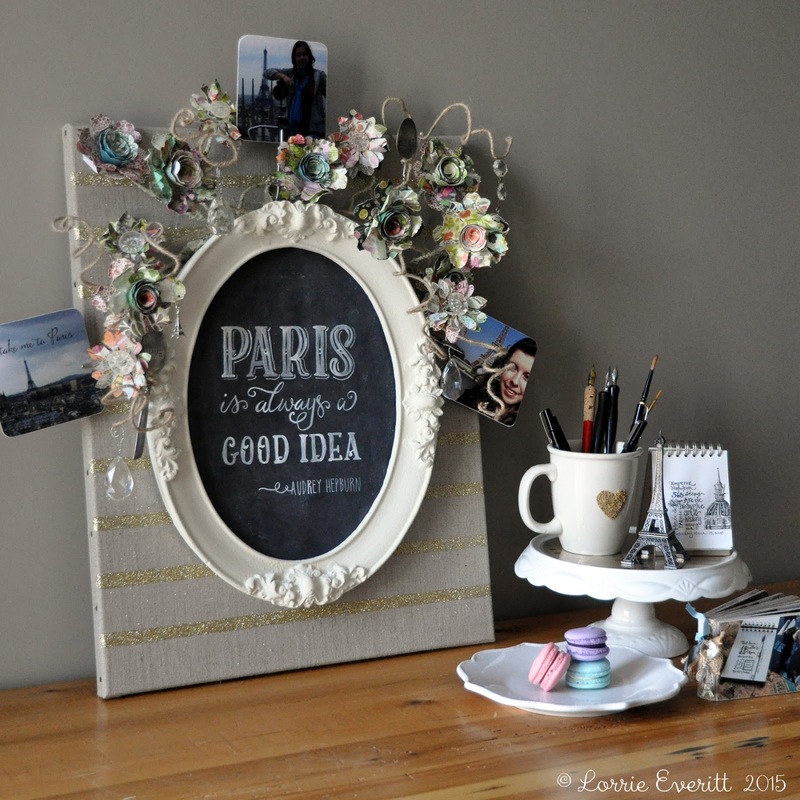 I think that Marie Antoinette would have liked my ornate oval antique picture frame which I painted with Martha Stewart's vintage chalk paint. As a reminder of the beautiful flowers from the Palace gardens, I created paper flowers from assorted scrapbooking papers, vintage glass buttons and wire stems wrapped with fabric strips. 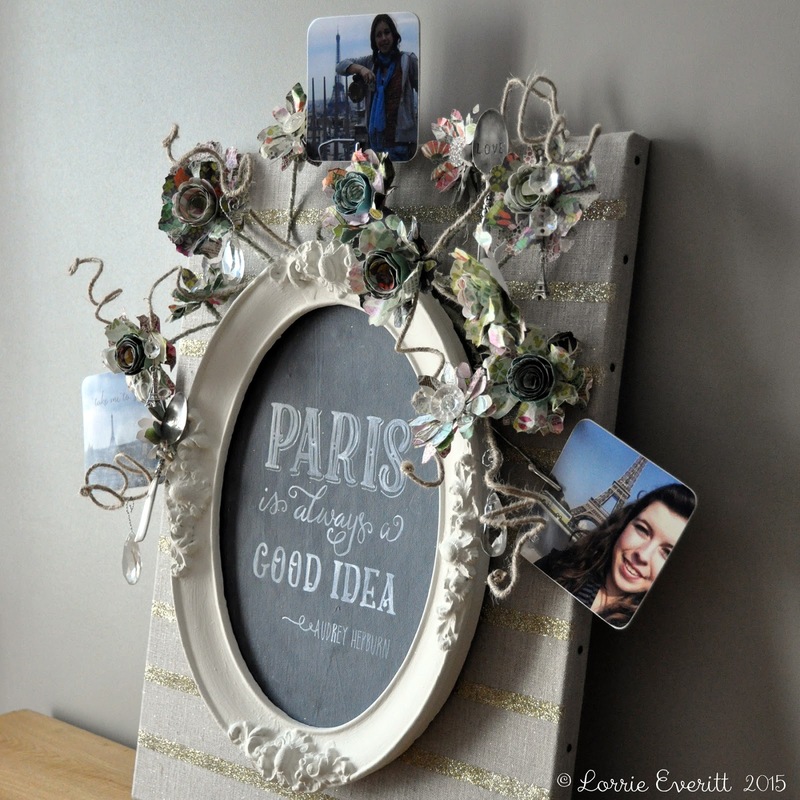 Twisted wire jute "vines" and paper flowers grow out from behind the oval frame and allowed me to hang vintage teaspoons that I stamped with the words "LOVE", vintage chandelier crystals and tiny Eiffel Tower charms that I purchased in Paris. I further personalized this piece by adding three photos that were taken in Paris. 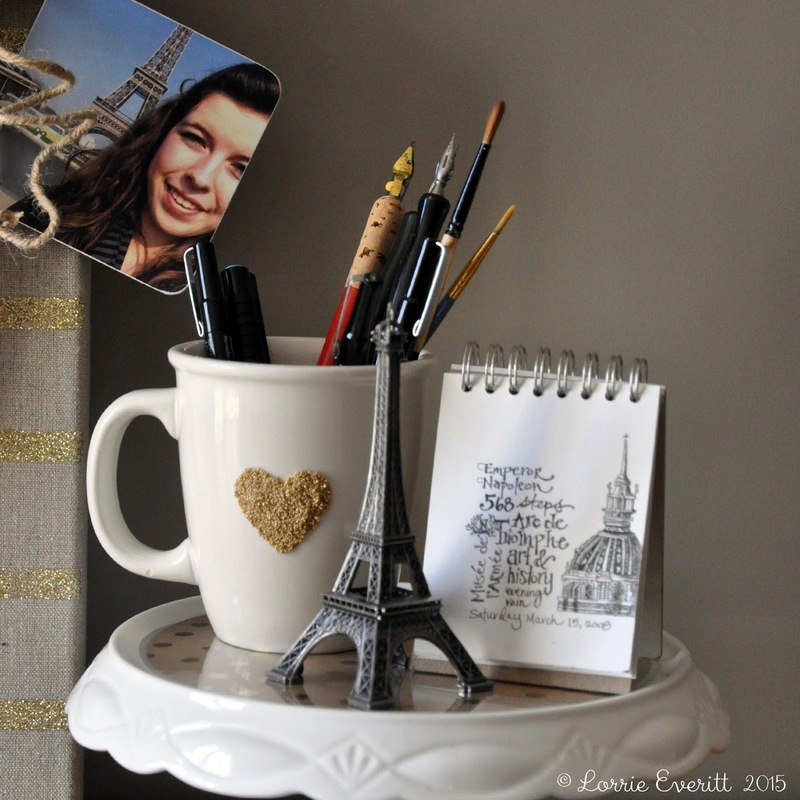 I am a little late entering the contest only because my youngest daughter was just in Paris this month for a March Break school trip and I wanted to make sure that her selfie by the Eiffel tower was included in my project. My oldest daughter’s photo with the Eiffel Tower in the background is one of my favourite photos of her at that age. 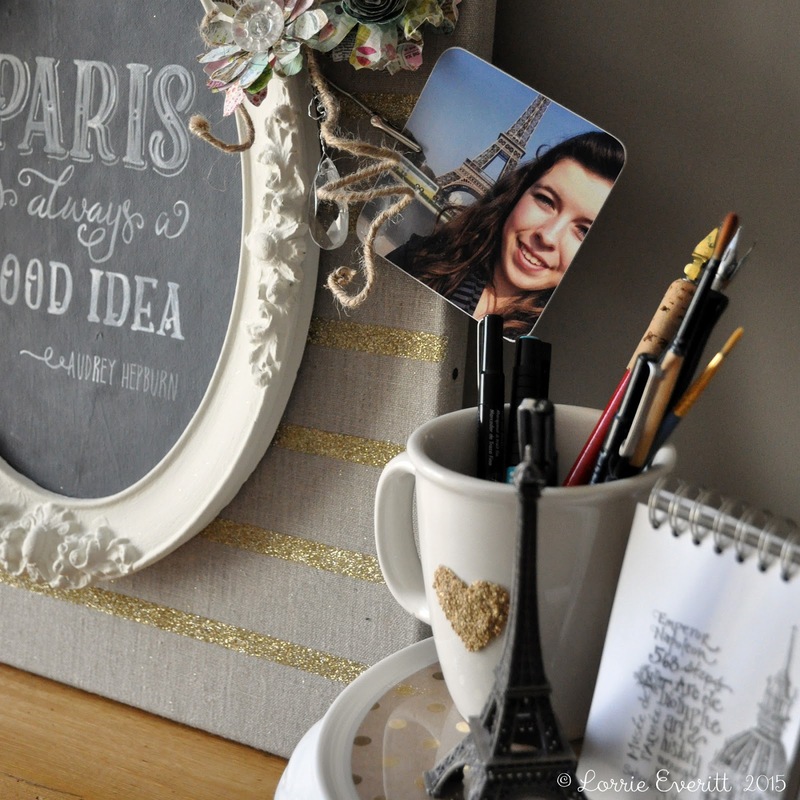 The third photo in my project with the words “take me to Paris” will hopefully be replaced at some point with a photo of my husband and I in Paris … of course by the Eiffel Tower. I photographed my entry to the contest as a lifestyle shot to set the mood for my project. I created the mug with the heart glitter beads a while ago. I keep thinking that I really should do a tutorial on the blog to show you how I have been making these dishwasher safe mugs using different kinds of glitter and inexpense mugs from the second hand store. 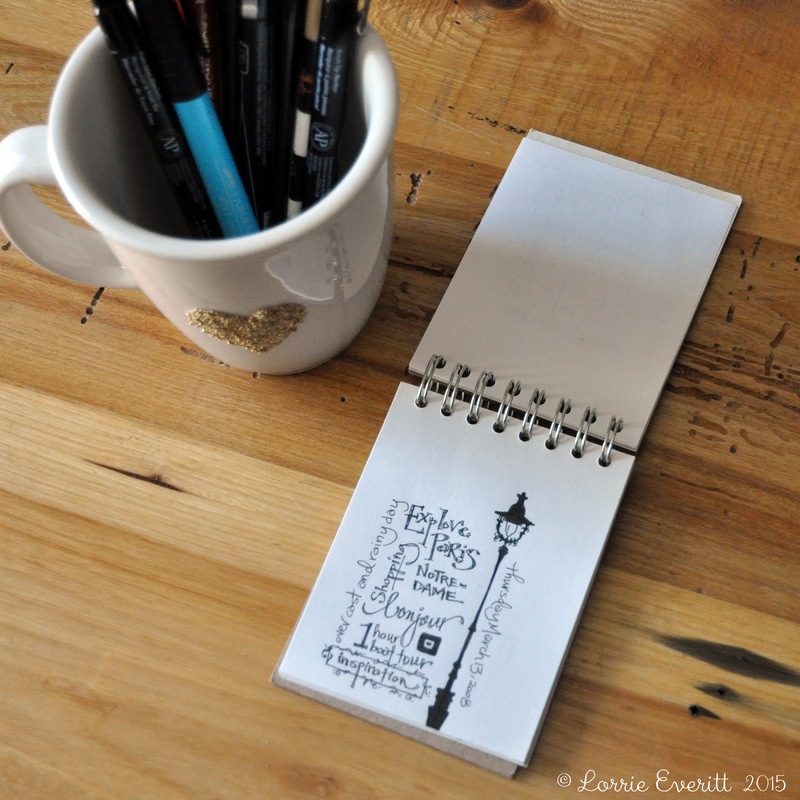 This is the mini sketchbook I took to Paris in 2008. I spent every night - after the kids were asleep - in my hotel room sketching things that we saw and did that day. The Michaels' Springtime in Paris contest winner will experience a sketching lesson with urban sketchers in Paris ... wouldn't that be awesome? The winner will also create a floral arrangement at the Catherine Mueller flower school and take a French cooking class at La Cuisine Paris. 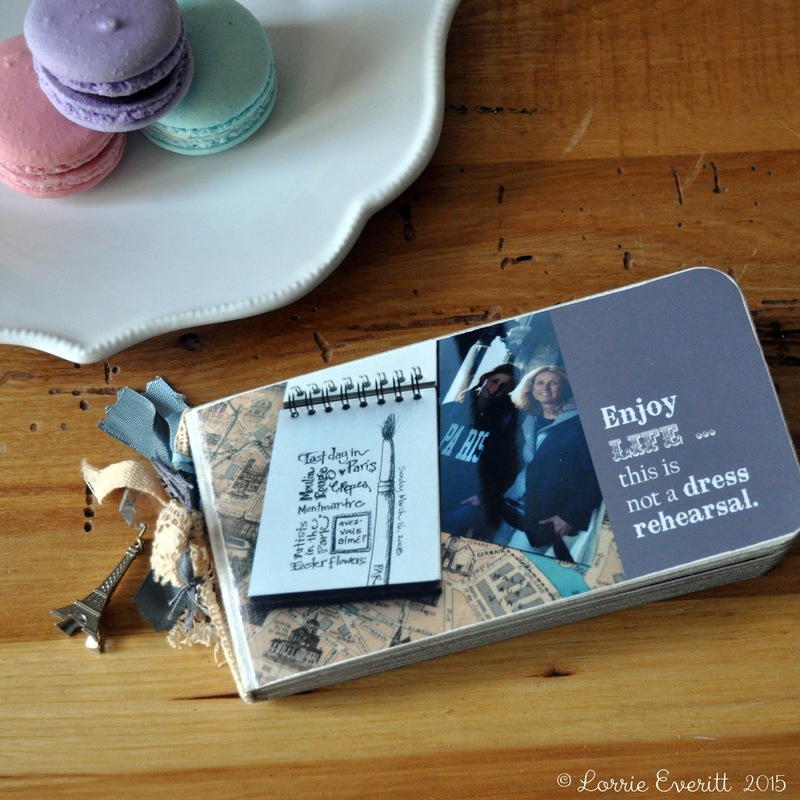 I created a few different memory books to remember my time in Paris with my daughter in 2008. 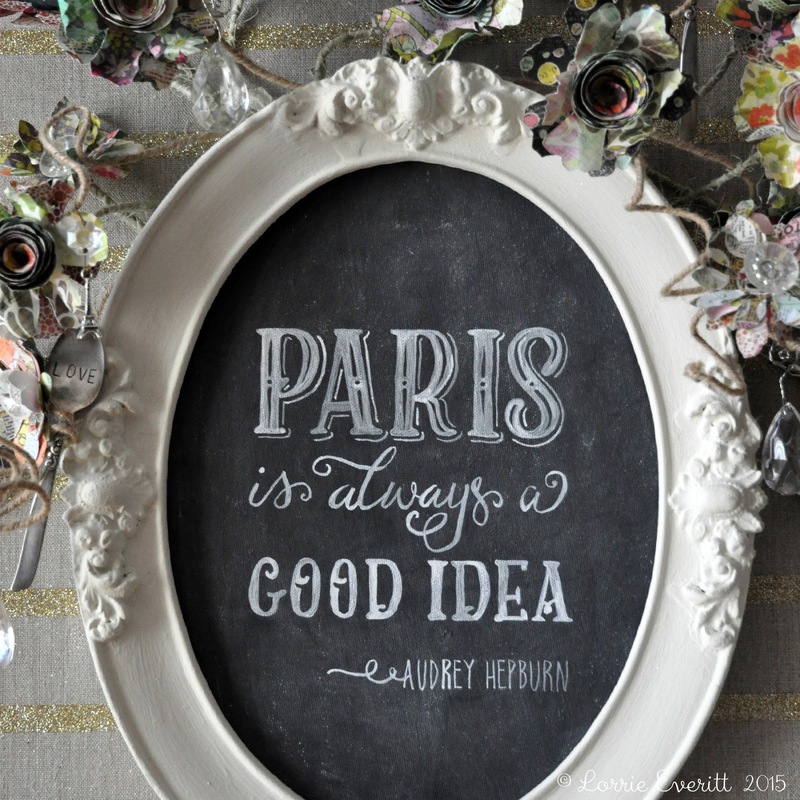 I am keeping my fingers (and toes) crossed that I get to make some new Paris memory books later this year. 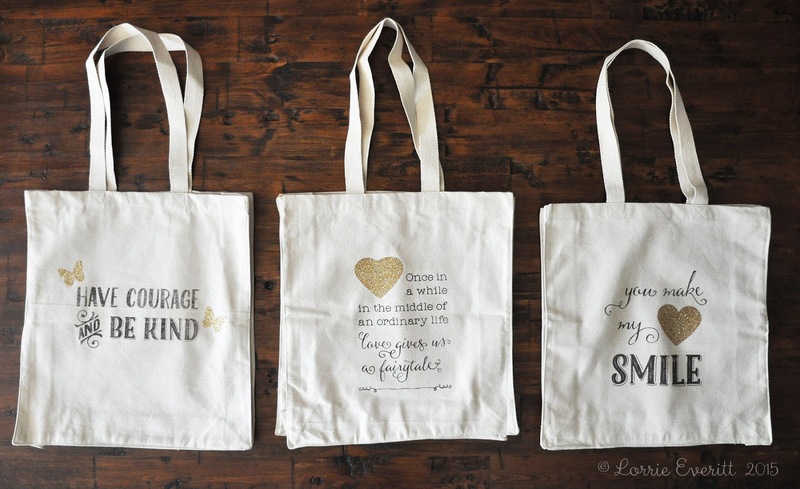 I bought a half a dozen of plain canvas tote bags before Christmas after seeing a bunch of adorable canvas tote bags with great quotes on them at Indigo. If you are like me, you see something in a store that you like, take a look at the price tag and say to yourself "I can make that". Then you go out and stock up on supplies but never seem to get around to making that awesome project. Well, I finally got around to embellishing my canvas bags and I'm really happy with how they turned out. 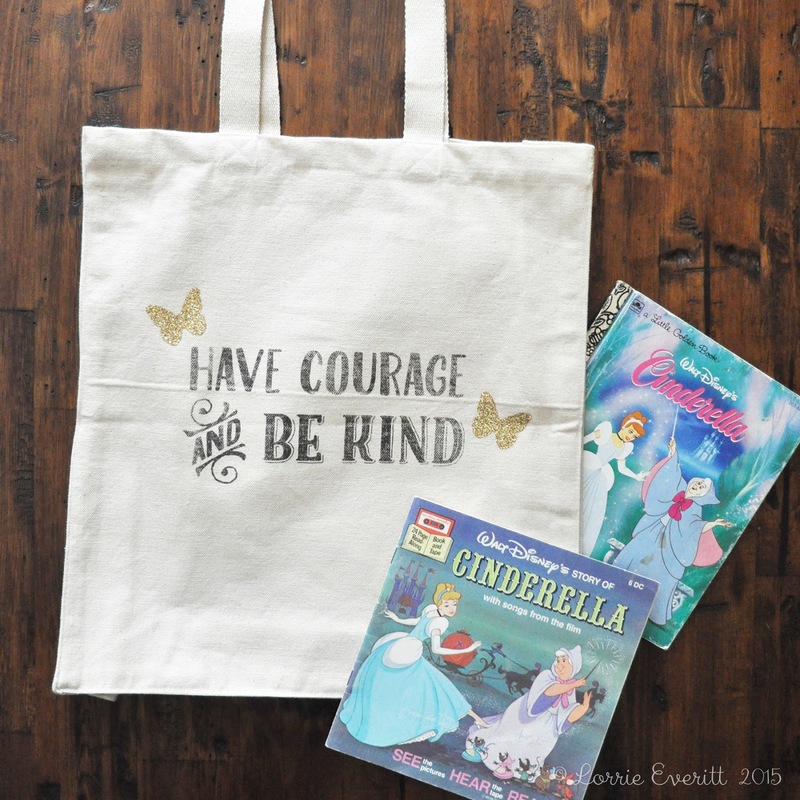 I used iron on transfers and iron on glitter on each bag. They were so easy to make and best if all - there was no sewing, no gluing and no mess. A. Find a quote or saying that inspires you. I looked to my Pinterest board for quotes and sayings that I have been collecting for projects like this. B. Use any word editing program you have to create the design for your iron on transfer. I worked in Illustrator to create mine, but you could also do this in Photoshop, Word or whatever you feel comfortable using. 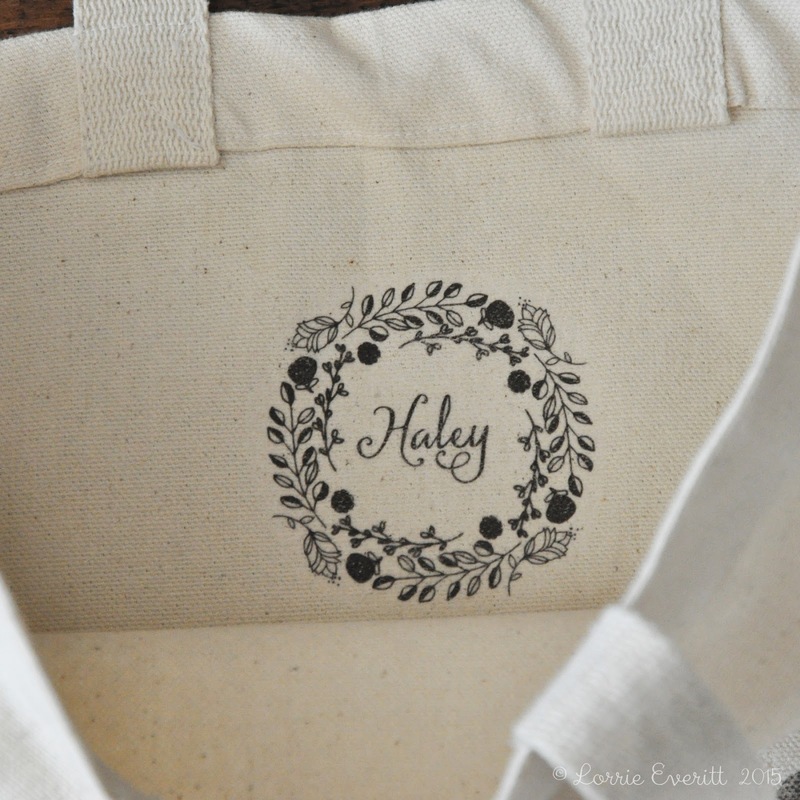 Some iron on transfers offer online support that allows you to create the art to use on their products - like this one. Note: I knew that I wanted to add some glitter iron on shapes to my design so I kept that in mind when I was setting up the type. 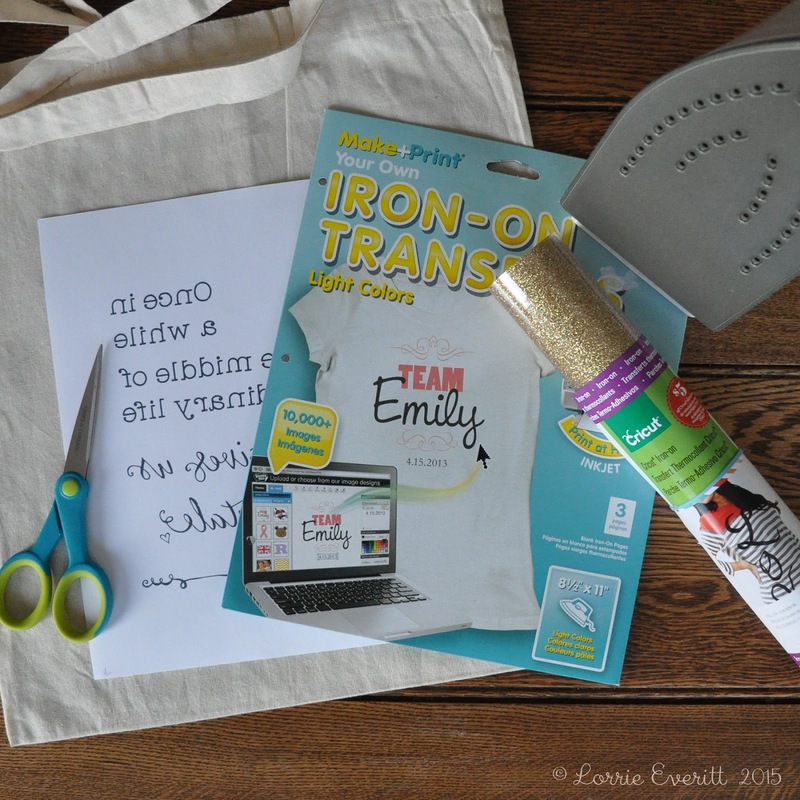 C. Print your iron on transfers on a laser printer. Follow the instructions on the package to ensure the best results for your transfer. 1) Most iron on transfers require you to print in "mirror image mode". You will iron the transfer paper with the white side up so I cut out the transfer to remove most of the excess white space so it is easier to work out placement of the transfer before ironing. 2) Place an old pillowcase over the transfer before ironing and follow the instructions for ironing on the transfer. 3) Some iron on transfers recommend peeling off the transfer sheet while hot and others recommend peeling after cooling for a minute. Either way - peel off the sheet slowing and check your transfer ... it is often possible to go back and iron again to fix any problems but you need to do it before completely removing the transfer sheet so take your time on this step for best results. D. I think that the iron on glitter gives this project a little something special. The iron on glitter material is so easy to use and I used my paper punches to create perfect heart and butterfly shapes for my bags. 1&2) My secret to using paper punches on the iron on glitter material is to remove the clear protective layer before punching for a cleaner cut. 3) The packaging instructions tell you how to iron on the glitter shapes. 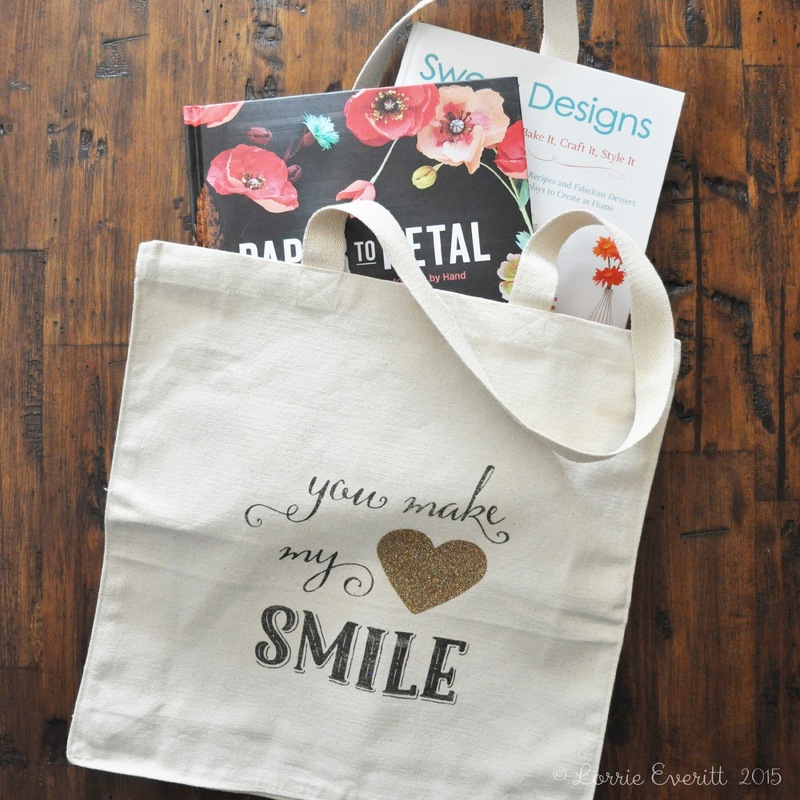 I was careful when I was ironing the glitter shapes to the bags so as not to iron over the lettering again - just in case! Iron on transfers are not inexpensive and even if they were, I hate to waste my supplies, so I created smaller designs (with my daughter's names) to add into the blank areas of my transfer sheetsnbefore printing. 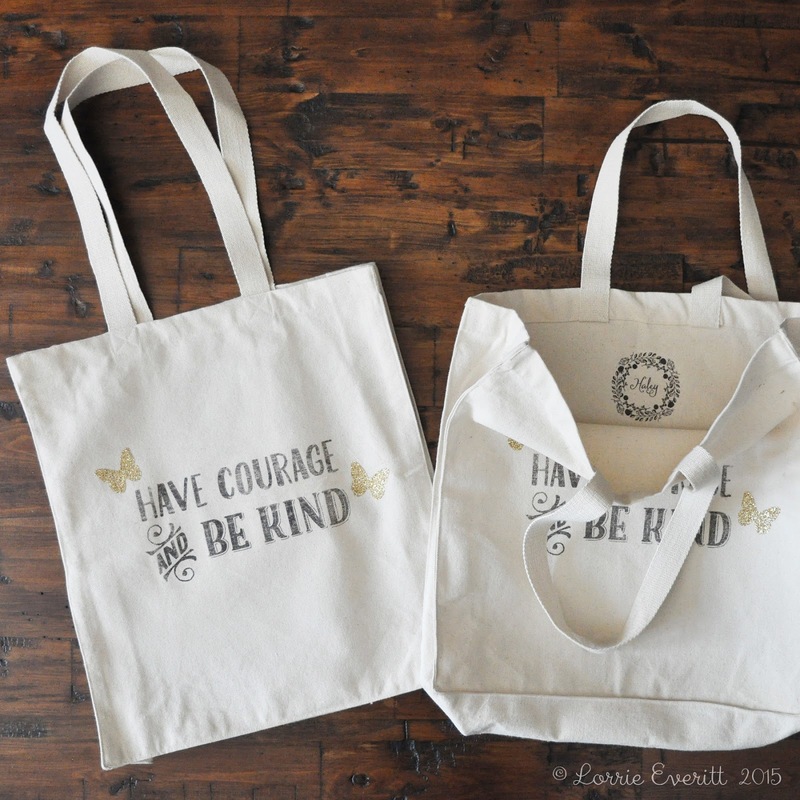 I ironed the smaller designs to the inside of some of the bags as an added touch. 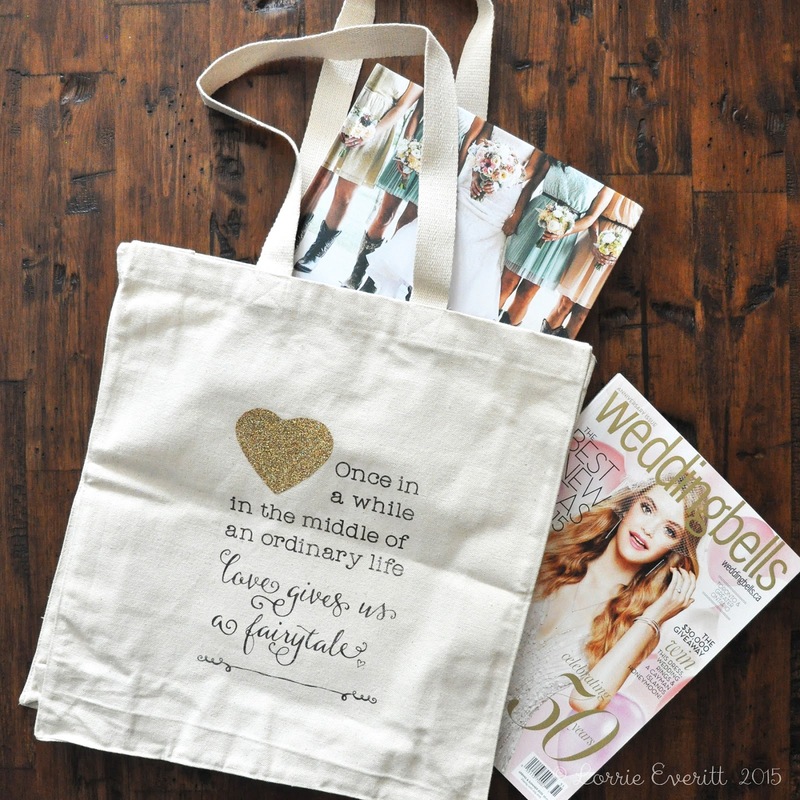 This would be an easy diy project for a destination wedding to use as guest bags. I saw a trailer for Disney's new live action Cinderella movie last year at a movie theatre. 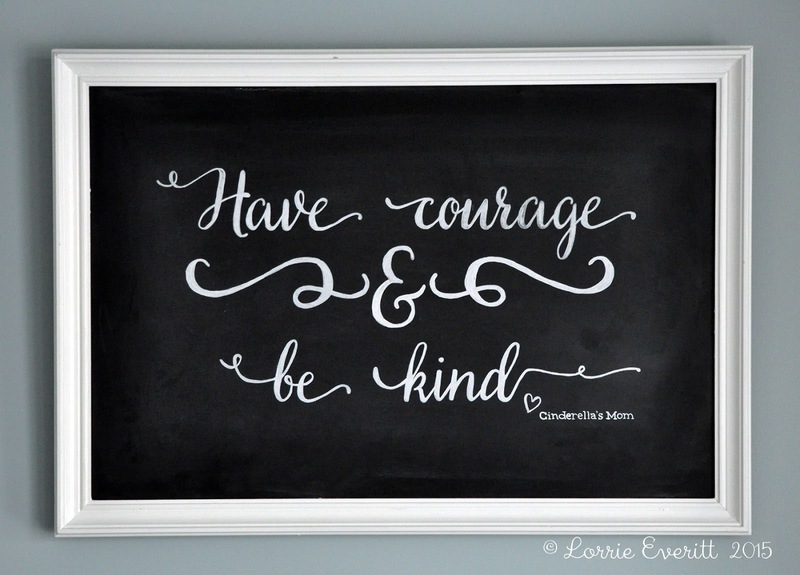 As soon as I heard the words "have courage and be kind" I had to dig through my purse to find a piece of paper and a pen because I knew that this was the inspirational quote that I needed for a project I was working on for my youngest daughter's bedroom. These are the words she sees every night before she goes to bed. To create this I simply painted over an old framed canvas painting from the second hand store. The white paint on the frame is Martha Stewart's vintage decor chalk paint left over from painting my daughter's night stand. A couple of coats of Martha Steward chalkboard paint completely covered the original canvas painting. I worked out the type on my computer first and printed it out in sections so I could trace the final design onto the canvas. I used chalk markers so that the design would not rub off when we I dust. The Cinderella movie opens today in theatres and from what I have read and heard so far the movie looks like it is going to be amazing. I can't wait to see it, hopefully with one or both of my "princesses" or perhaps with my "Prince Charming". I love the quote in today's (Toronto Star) from Lily James about the movie and her role as Cinderella. She was talking about the fact that she does not believe in the myth of Prince Charming and she said "I don't think he comes and saves you. But I do believe in true love and I do believe in two people meeting and enriching each other and making each other feel like life is worth living." I believe that too and I think I may have to add that quote to the back of this piece!! I put together this feel better gift basket for my sister-in-law a few weeks ago. 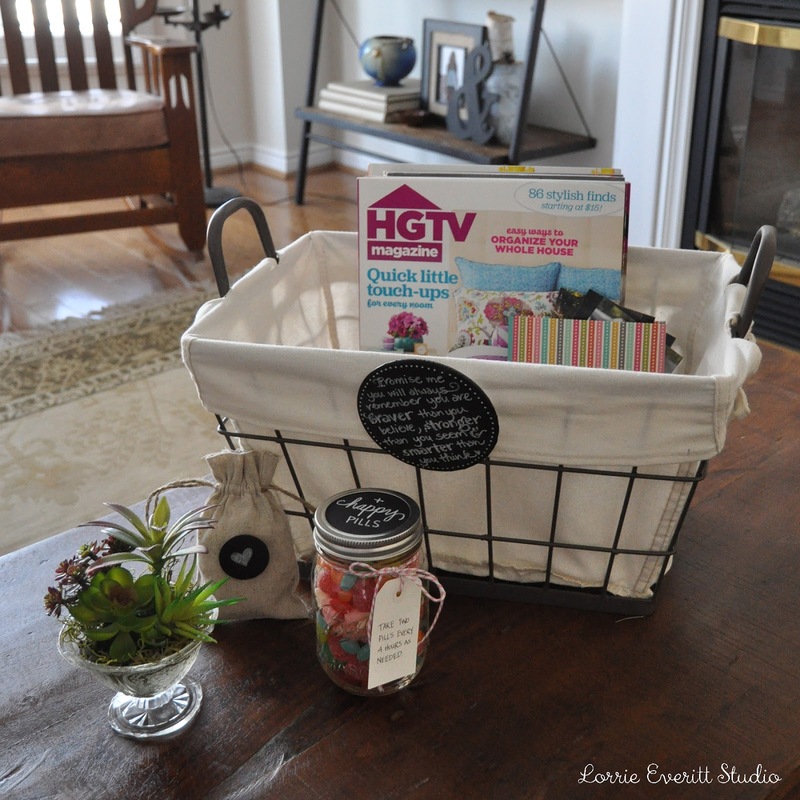 Today I thought that I would share some of the diy projects I made to fill and decorate the basket. My husband and I were in Barcelona last fall and I fell in love with an adorable little candy shoppe called Happy Pills. 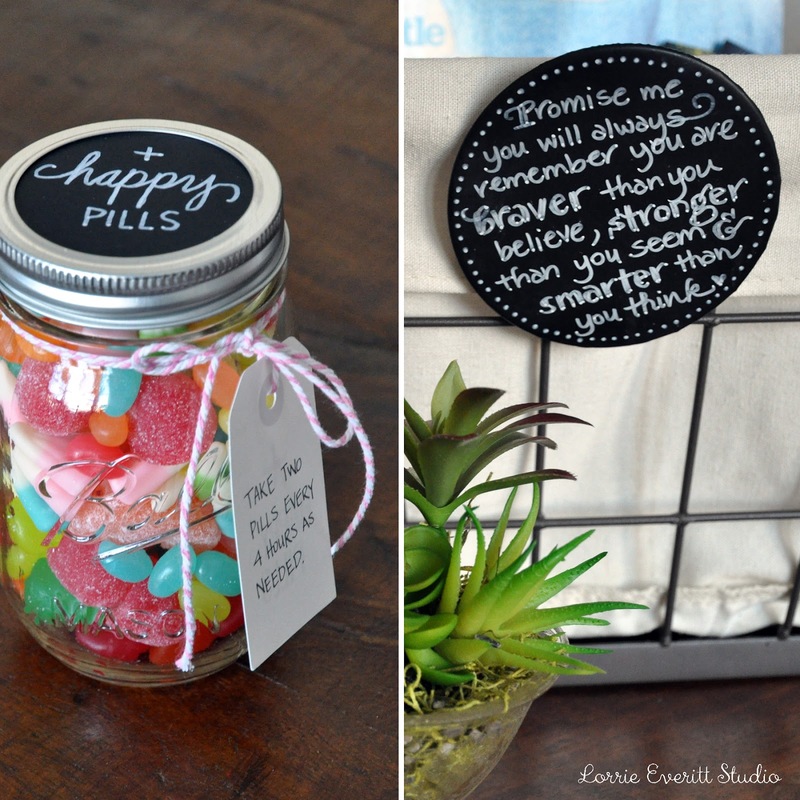 I borrowed their idea and filled a mason jar with lots of colourful and yummy candies. I added a paper tag to the jar with my directions .... "take two pills every 4 hours as needed". I knew that my sister-in-law would have lots of little visitors so this jar full of candy was for her & to share! I have a thing for motivational quotes and chalkboards (if you don't believe me - check out my Pinterest boards) and instead of buying a get well card I made a button to add to the basket liner. 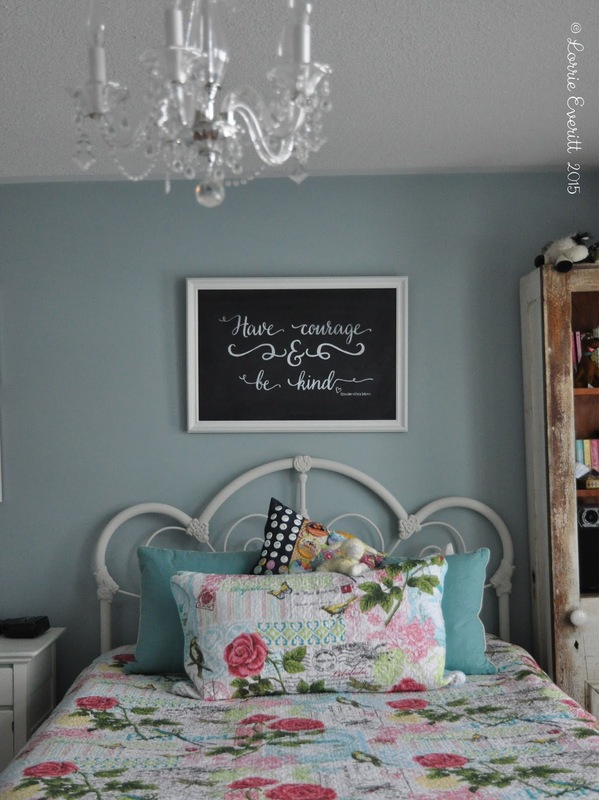 This was a very simple project - I spray painted a large pin-back button with chalkboard paint and used a chalk marker to write out the Winnie-the-Pooh quote. I filled a linen bag with hair bands and ties and decorated the bag with another "chalk board button". Flowers are lovely but not always practical and can require additional care to water ... so I created this petite arrangement of (fake) succulents in an antique glass container. 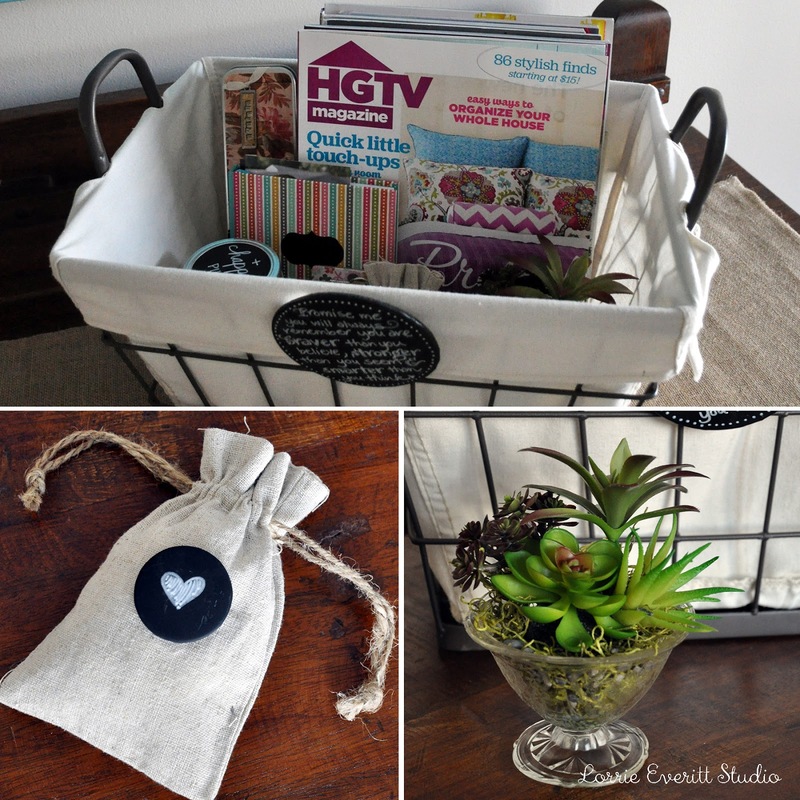 I found the wire basket with the canvas liner at Winners - it was the perfect size to hold magazines, books and all of my diy projects.